Jacob Nicol (5) of Fairbanks leaps for a layup while Trevyn Feasel (3) of North Union attempts to block the shot. Connor Terrill (0) of North Union watches on. Nicol tallied 15 points during the Panthers’ 59-41 win over the Wildcats. Both the Fairbanks Panthers and the Wildcats of North Union have lately found themselves on the winning side of the scoreboard. 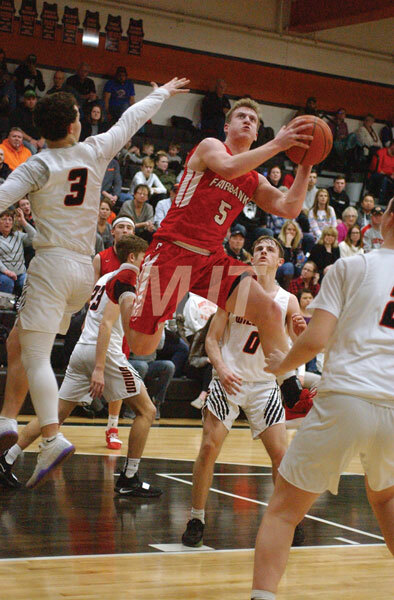 The Wildcats had a four-game winning streak as they hosted Fairbanks, which was riding an eight-game burst headed into Tuesday night’s game. With the streak on the line, the Panthers upped their winning ways to nine in a row as they beat the Wildcats, 59-41. Fairbanks head coach Justin George said it was solid defense that was able to help the Panthers win. “I think defensively for the course of the game we locked down pretty good, especially the second half,” he said. Both teams kept each other tight both defensively and offensively, as the man-to-man defense displayed by each kept a tight score throughout the opening stanza. The Cats found some three-points goals from Preston Crabtree and Connor Terrill that helped them tally 13 points at the end of the first set. The Panthers matched that with a three by Seth Standley and solid post play from Braylon Green, who tallied six points. The slow play continued in the second quarter as each team maintained solid defense that kept ball movement and inside passes to a minimum. Crabtree was able to work the baseline to find some reverse layups for four points. Trevyn Feasel and Harley Day added jumpers to help the Cats notch nine points in the quarter. The Panthers, though, got a three-ball from Cross Hackathorne that gave the Panhers a 23-22 halftime edge. North Union head coach Brian Terrill said his Cats felt good going into the locker room. “We felt really good at halftime,” he said. “We had 12 turnovers at the half and were only down one. That egg came in the form of a 9-2 FHS run during the first three minutes of the third quarter. Fairbanks took advantage of some NU defensive lapses by making some long passes from the baseline for easy layups. George said his defense made its mark on the game by holding NU to only a handful of points. Terrill said the defensive mental mistakes are something the Cats have been able to avoid over the recent past. The solid defense and spot-on shooting from the Panthers allowed them to stretch their lead to 46-33 at the end of the third set. The final stanza was a repeat of the previous period as the Panthers maintained their control with solid shooting from Hackathorne and Nicol, who combined for 13 points. The Wildcats had to notch their points from the line as they attempted to pick up the offensive tempo with drives down the paint. The Cats hit six-of-eight from the line, but the earlier damage was too much to overcome. Terrill added that the mental mistakes really cost NU the game. The Panthers will attempt to close out their conference season with a perfect record as they host Northeastern on Friday. NU will attempt to rebound when it hosts Central Buckeye Conference opponent Graham on Friday. Hackathorne 5-3-16, Nicol 7-0-15, Green 7-1-15, Beem 3-0-6, Smith 2-0-4, Standley 1-0-3. Totals 25-4-59. Crabtree 4-1-10, Day 4-2-10, Terrill 3-2-10, Feasel 2-2-6, Krebehenne 1-0-2, Wells 1-0-2, Vernon 0-1-1. Totals 15-8-41.